I’m normally not all that concerned with awards unless they serve a purpose other than ego massage, but I’m going to ask you to help out and nominate lines and colors for these awards because there is such a purpose here, namely the possibility of wider exposure for the blog, and by extension, for the topics, people and kinds of art featured on lines and colors. One of my stated reasons for writing lines and colors is the desire to open as many eyes as possible to the amazing visual treasures that exist in various times, styles, genres and approaches to visual art; and in particular, to expose people to visual arts in areas other than their usual favorites; in effect to cross-pollinate the genres. 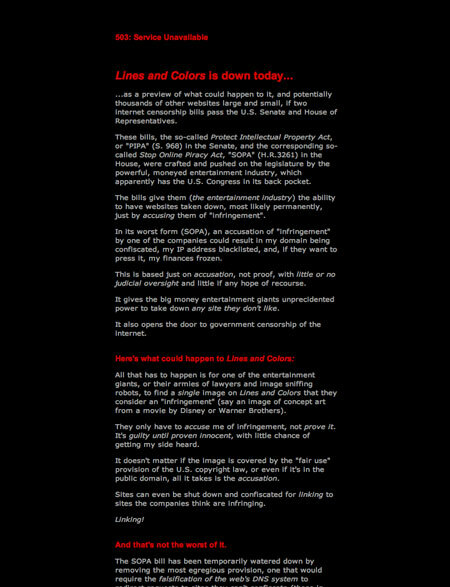 You must supply a URL for the weblog (for lines and colors, that would be “http://www.linesandcolors.com”). You can only submit one nomination form; if you attempt to re-submit at some point your new ballot will replace the previous one. You can nominate as many other blogs in various categories as you like, but you must nominate at least 3 different blogs total somewhere on the form for it to be a valid nomination. I’m sure you all have some favorite blogs in other categories, and additional choices in the “best art or craft weblog” that you would like to see promoted. To nominate three blogs should only take you about 5 minutes. If you want a chance to participate in the final judging of nominees, be sure to check the checkbox at the bottom of the page, above the space where you enter your email. Three panels of 50 participants will have the ability to vote by email in the final judging. The nominations close at 10 PM Eastern Standard Time (GMT-5) on Friday, January 11, 2008. I believe that the nomination process is more important here than the final voting. The objective isn’t to be “winner”, but to get lines and colors listed as a nominee, thereby exposing the blog, and the topics I cover on painting, drawing, illustration, comics, cartoons, concept art, matte painting, animation, paleo art, science fiction and fantasy art, digital painting, artist tools, painting-a-day, museum shows, the great classic illustrators, and all of the individual artists that I write about, to a broader audience. If you feel that what I’m doing with lines and colors is worthwhile, this will be a great way to show your support. Addendum: Nominations have closed. Thanks to all of you who took the time to nominate lines and colors. Whether lines and colors is on the final ballot or not, you can vote for the 2008 Bloggies from January 22 to January 31.